Day 7 – 70 kms. 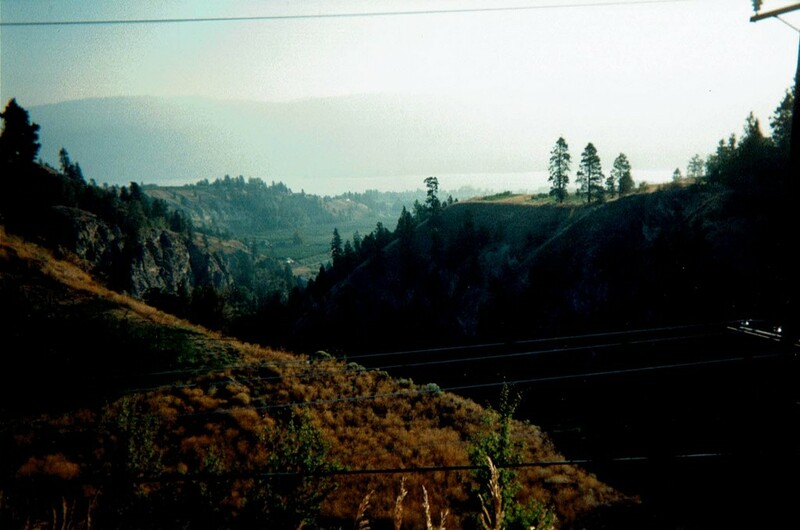 From Penticton, this section of the KVR is known as the Princeton Subdivision. Before we left Penticton we brought ourselves up to date on the news regarding a major forest fire that was burning north of the town of Tulameen, where we planned to ride through on the next day after this one. The news wasn’t very positive, but we were safe to continue to our destination for this day. The first few miles of the KVR from Penticton pass through the Penticton Indian Band lands and permission is required. We received no answer from the phone number provided so we opted to take an alternate route, mostly on paved roads for which we had been given directions. Also, tracks are still on the railbed from West Summerland Station almost to Faulder Station; a steam train is active on this section of track for tourists and sightseers. The problem with taking the paved roads was that the gentle climb of rail grade was replaced by quite a few miles of gruelling hills! We did however access the KVR in small doses and crossed the highest bridge of the KVR at our first crossing of Trout Creek. The view from the trestle was nothing short of spectacular! At Faulder we re-joined the railbed which was still a bit sandy. We forded one small creek and then came to a real obstacle as we had to cross Trout Creek and the bridge has been removed. Luckily the hot dry summer had left the water level fairly low, but getting down to it proved to be quite a challenge. The steep bank made it a two man job for each of our loaded bikes, with one guy holding the back of the bike back with a rope, while the other guy held on to the front. Kind of like a rodeo! We still had to take most of our gear off the bikes to get across the creek though. Another two man job getting back up to the railbed too. 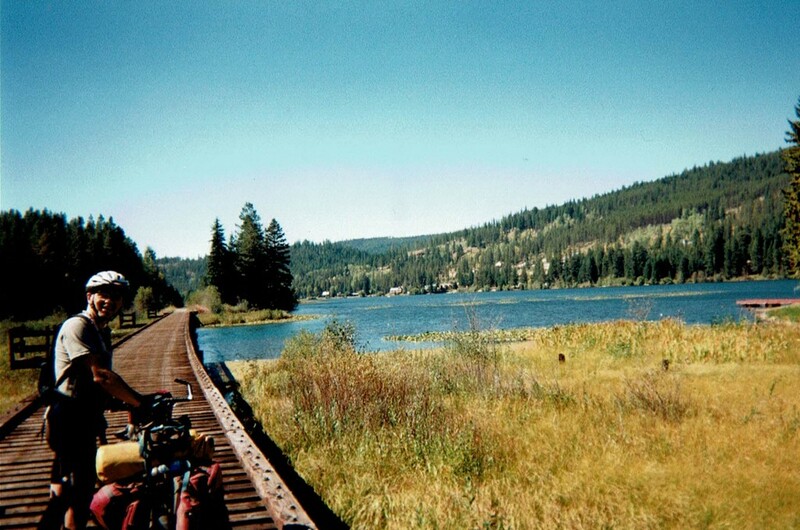 Up to this point, the railbed had been closely paralleling Highway 40 and Trout Creek. It continued to do so for the next 25 kms with the highway actually taking over the railbed in places. One more missing bridge at Kathleen Creek was easily bypassed by using the road bridge. A long low pile trestle greeted us at Osprey Lake then after riding along the lakeshore we turned off to find a backcountry campsite at nearby Link Lake. The campground wasn’t the best and was quite grubby with few options for tenting. We opted to continue on the dirt road around Link Lake and found that it rejoined the KVR (the book does not show this, but indicates that the road stops at the campsite). Very soon after rejoining the trail we arrived at Bankier where the general store was closed and up for sale. There was Roxy’s B&B/Camping across the trail from the store, so we set up camp there and made full use of their quaint bath house. Day 8 – 50 kms. Once again we listened to the radio before heading out and heard that a forest fire was still raging; property owners were being evacuated from the Tulameen area. The circumstances were not good for continuing on the trail after Princeton. However, we still thought that the fire could be by-passed by an alternative road route. We struck out for Princeton. Mostly an uneventful day with varied terrain on the trail and some wash-boarding of the surface as evidence of truck traffic in places. Part of this section of the trail winds through cattle ranches and the cattle stand in the shade of the bush along the trail. It was very spooky, as sometimes all I’d spot as I was riding by, would be a pair of big eyes staring out at me! I also picked up my souvenir of the KVR on this section, a rail spike! The closer we got to town the more we could smell smoke in the air, as the forest fire was only about 30 kms northwest. So in Princeton we headed for the local bike shop for a trail and fire update. Also, Larry P needed some work on his rear derailleur. The bike shop owner advised against travelling any further on the trail and told us that in fact the KVR had officially been closed. 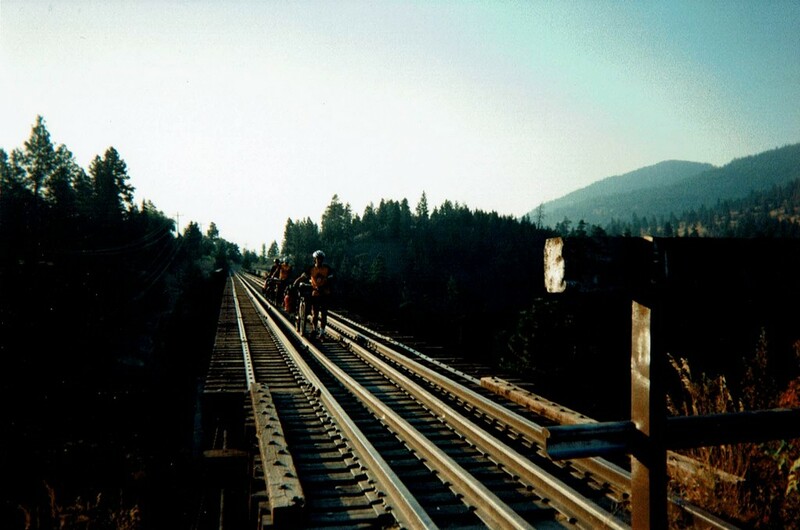 However, he said he could probably rustle up a friend of his to take us and our bikes to Coquihalla Station. We weren’t sure how much of the KVR was rideable after Coquihalla Station so Doug and Larry P figured that they may as well finish their KVR tour here in Princeton and head back to Castlegar via Highway 3 (a two day ride) to pick up Doug’s vehicle. That left the four of us to get a ride. We decided on the truck option instead of riding our bikes around, as we possibly would have been riding through thick smoke, not a good idea! We split the cost between us and it worked out to a reasonable C$25.00 each. We said goodbye to Larry P and Doug and stowed all our bikes and gear in the box of the truck; off we went! On the road north to Merritt we did see thick smoke for many miles to the west of us as we passed the area of the forest fire, and the wood-smoke smell was very noticeable. After Merritt we turned south on the Coquihalla Highway to Coquihalla Lakes Lodge where we would camp for the night. Day 9 – 60 kms. Although it was only the beginning of September, we had a cool night at the lodge campground. Not surprising though as the Lodge is actually at the summit of Coquihalla Pass at 1244m/4080 ft. So after a hot breakfast of oatmeal we set out to find the trail. We were now on the Coquihalla Subdivision of the KVR. This was a remarkably scenic section of the KVR, and for Andrew McCulloch, the engineering of this section must have presented many demanding challenges. One can only imagine travelling on a train along this precarious route. Apparently, many of the passenger trains only travelled at night so that the passengers couldn’t see the sheer drop-off at the edge of the track bed and realise the height of the trestles that they were crossing! 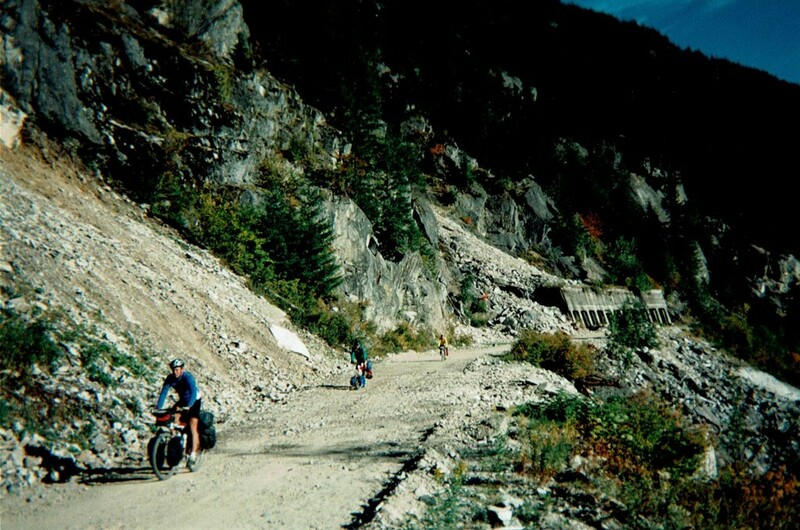 Some parts of the Coquihalla Highway were built almost on top of the original KVR railbed and there are several short sections of the trail that can be ridden. We opted to take the Trans Mountain Pipeline Road, which kind of parallels the highway and takes the same route as the KVR once did. The pipeline road is a construction road, hence on a normal basis access might have been prohibited. But we happened upon it on a long holiday weekend day, so no work was taking place, which meant absolutely no traffic for us! The road is definitely not rail-grade though and is very much like a logging road with variable grades and rough or rocky surfaces in places. Some grades were exceptionally steep both in the downhill and uphill mode. 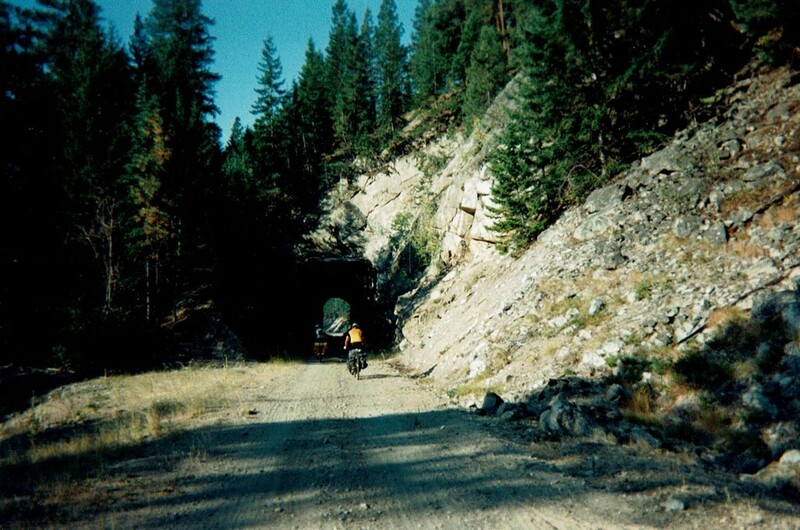 On some sections, we were actually riding on the KVR railbed and at other times we were on the road looking up at the remains of the railbed, trestles and tunnels above us on the mountainside. 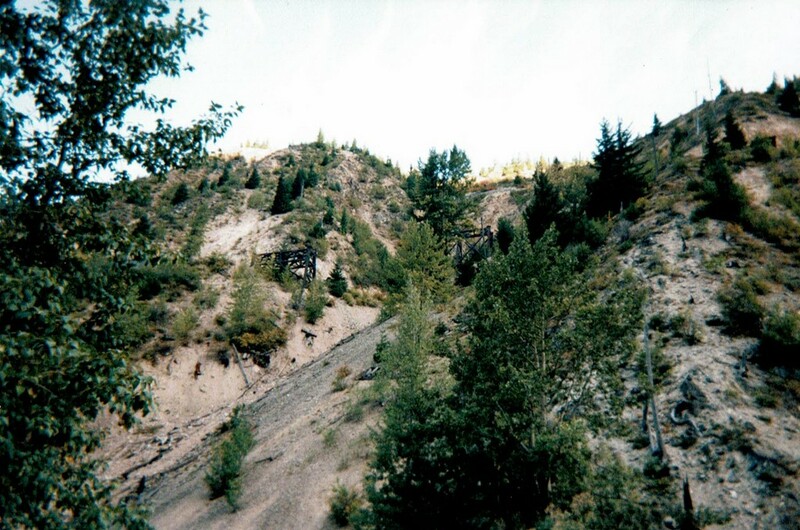 The photo shows the remains of one trestle that suffered extensive damage from a large washout. Tunnel entrances could clearly be seen, but the railbed leading up to them was long gone. We cycled around a snowshed that was caved in and saw other such indications of the KVR along this route. The pipeline road ended when we reached the Coquihalla Highway once more, at km 54 of this subdivision. Our next 20 kms had to be ridden on the highway as we felt that accessing the short portions of the KVR that were still rideable was not worth the effort. The Coquihalla grade was downhill so we had a fast run to Othello Road, where we did rejoin the KVR. 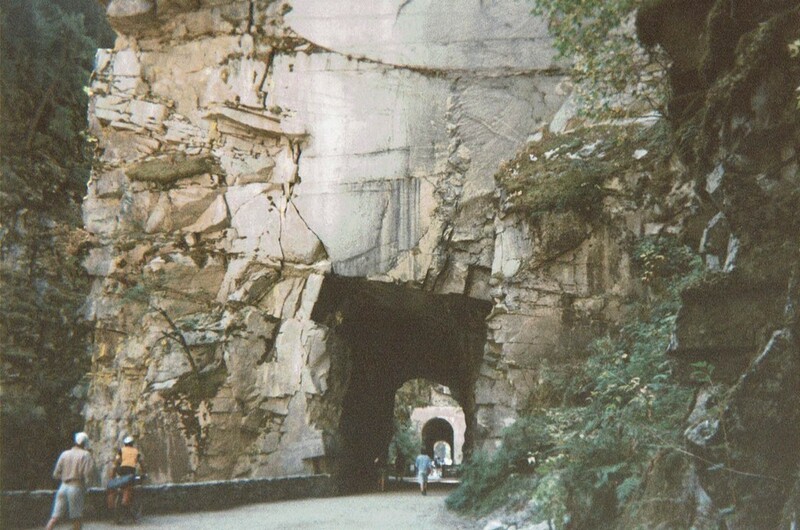 Othello Station is at the start of the Coquihalla Canyon where McCulloch performed his most incredible feat of surveying, then blasting four tunnels in perfect alignment through the canyon walls above the river, simply amazing! The tunnels are connected by trestles. The area is now a Provincial Recreation Area and is known as the Quintette Tunnels (although there are only really four tunnels, but the third tunnel seems as if it were two). We rode slowly through the tunnels in awe and met many tourists in the area enjoying the nostalgia of a railway that once was. At the end of the tunnels the trail continued for a few more kilometres until we joined Kawakawa Lake Road and our final run to Hope Station. Although we arrived in Hope a day earlier than planned, my wife and Larry Mc’s wife had the also arrived in Hope that day, to stay the night and pick us up the following day. So they were really surprised when they were walking by the fish and chip shop in Hope – that we had dived into for lunch and a beer – and spotted our bikes outside and through the window all of us filling our faces! After lunch we said goodbye to Tim and Larry N as they had decided to ride back to the Tsawwassen to Swartz Bay ferry (ultimately, Victoria) via the highways. This would be a day and a half ride for them with one more camp night. The whole trip was marvellous and I wish that we could have ridden the Tulameen and Brookmere areas, but it was not meant to be with the fire situation as grave as it was. The fire was actually put out a few days later, but the area was devastated for quite a while. I speculate that perhaps I’ll have to go back and ride that section another time and combine it with one of the KVR spurs to Nicola and then the Nicola, Kamloops and Similkameen railbed to Spences Bridge. Some cyclists might be able to ride portions of the KVR with a good touring bike and suitable tires, but for the varied and sometimes unpredictable terrain, I would recommend a mountain bike with front suspension. Three of our group didn’t have front suspension and found that the constant jarring of some of the sections was very tedious and tiring, which translated to sore shoulders and arms. Moderately aggressive wide tires would also be a preference and provide a rider with good traction on some of the looser surfaces and sandy sections of the trail. If you’re only used to road touring, then it would be prudent not to be over-ambitious with daily mileages when trail or off-road touring. We found that covering 75 kms off-road is quite a contrast to the same distance on a paved road.